Therapeutic Update 2019 is organized by University Learning Systems (ULS) and will be held from May 01 - 03, 2019 at Hyatt Centric Key West Resort & Spa, Key West, Florida, United States of America. The target audience for this medical event is physicians, pharmacists, physician assistants, nurses & nurse practitioners and Other Health Professionals. 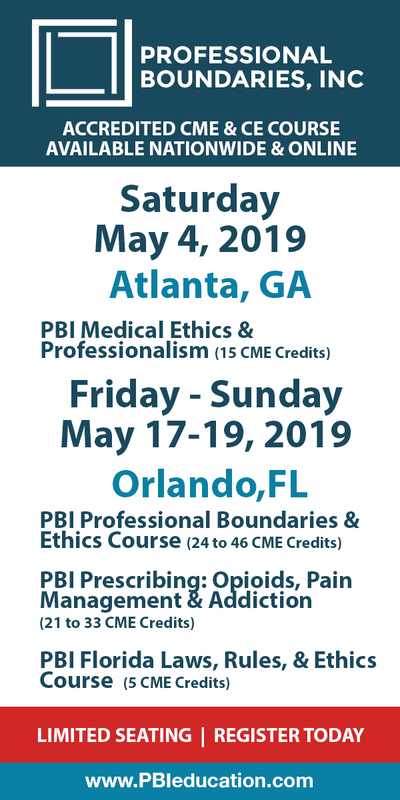 This CME Conference has been approved for a maximum of 15 contact hours (1.5 CEU) over three days, 5 hours per day, of live AAFP/ AMA PRA Category 1™, ACPE and pharmacology CE/ CME credits. Session 1: New Drug Update, Part 1 (5 Contact Hours) Session 2: New Drug Update, Part 2 (5 Contact Hours) Session 3: Evidence-based Medication Therapy Management to Optimize Patient Outcomes (3 Contact Hours) This Live activity has been reviewed and is acceptable for up to 15.00 Prescribed credit(s) by the American Academy of Family Physicians. Physicians should claim only the credit commensurate with the extent of their participation in the activity. This conference, Therapeutic Update 2019 is a popular CE/CME program, which includes the latest new drug information. Additional details will be posted as soon as they are available. 20th Annual Dermatology in the Keys "Derm for the Non-Derm"
20th Annual Dermatology in the Keys "Derm for the Non-Derm" is organized by USF Health's Office of Continuing Professional Development and will be held from May 29 - Jun 02, 2019 at Casa Marina Key West, A Waldorf Astoria Resort, Key West, Florida, United States of America. Target Audience: Physician Assistants, Nurse Practitioners and PCPs providing dermatologic services or those desirous of learning and enhancing their dermatologic diagnostic, therapeutic and procedural skills. Accreditation Physicians: USF Health is accredited by the Accreditation Council for Continuing Medical Education (ACCME) to provide continuing medical education for physicians. USF Health designates this live activity for a maximum of 29 AMA PRA Category 1 CreditsTM. Physicians should claim only the credit commensurate with the extent of their participation in the activity This Live activity, 20th Annual Dermatology in the Keys "Derm for the Non-Derm", with a beginning date of 05/29/2019, has been reviewed and is acceptable for up to 29.00 Prescribed credit(s) by the American Academy of Family Physicians. Physicians should claim only the credit commensurate with the extent of their participation in the activity. Nurses: USF Health is accredited as a provider of continuing nursing education by the American Nurses Credentialing Center’s Commission on Accreditation. A maximum of 29 contact hours may be earned by learners who successfully complete this continuing nursing education activity. Breakdown of credit hours: Main Conference: 19 hours Workshops: • Clinical Skills Workshop - 3 hours • Dermatologic Surgery Workshop - 3 hours • Electro/Cryo/Biopsy Workshop - 3 hours • Dermoscopy Tutorial - 1 hour Course Description: There is an acute shortage of dermatologists in the United States. Dermatologists are shifting away from medical dermatology with many now focusing on cosmetic and oncologic procedures. Physician Assistants and Nurse Practitioners are rapidly becoming the medical dermatology providers as are primary care physicians. Medical and basic dermatologic surgery procedures have been identified as high priority in several needs assessment surveys for CME. Several mini-symposia, focusing on the diagnosis and management of common skin problems likely to be encountered by providers will be presented by distinguished faculty. 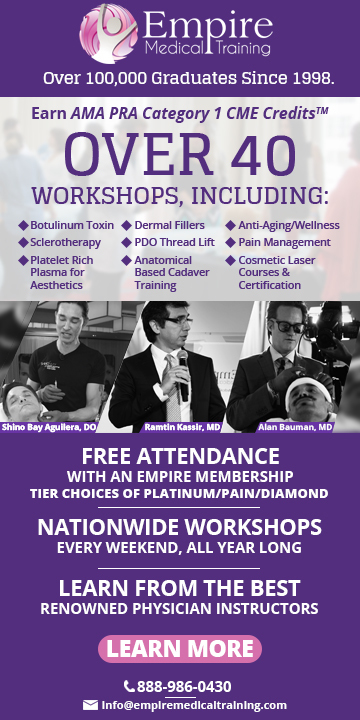 Interactive workshops have been designed in this program to develop your dermatologic procedural skills, and challenge your diagnostic acumen. Clinical Skills An interactive session designed to increase the participants’ ability to recognize and treat common skin disorders. Our most popular workshop! • Enhance your diagnostic acumen • Formulate a differential diagnosis Dermatologic Surgery An introductory lecture followed by a “hands-on” workshop precepted by dermatologic surgeons in small group settings. Take your practice to the next level! • Participants will “operate” on artificial skin to develop or refine their surgical techniques • Emphasis will be placed on simple excisions with the opportunity to explore more complex flaps • Instruments available for use during the workshop SPACE IS LIMITED TO FIRST COME FIRST SERVE BASIS! Physicians and Advanced Practice Providers Only. Electrosurgery/Cryosurgery/Biopsy Lecture and “hands-on” workshop in electrodesiccation & curettage and cryosurgery techniques. Opportunity to practice shave & punch biopsy techniques on artificial skin. • Demonstration by expert’s techniques on artificial skin. • Up-to-date equipment available for practice • Understand when, where and how to use this equipment You should be doing these procedures! Physicians and Advanced Practice Providers Only. Dermoscopy Tutorial Dermoscopy is a “cutting edge,” noninvasive technique utilizing a specialized magnifying device to greatly enhance diagnosis of skin lesions. With Dermoscopy, morphologic features are visible that cannot be detected by the naked eye alone. Enhance your diagnostic Skills! • Increase your diagnostic accuracy for pigmented skin lesions in general and early invasive melanoma • Learn pattern analysis • Complimentary lunch Learning Objectives: Upon the completion of this activity, the participant should be able to: • Identify and manage common dermatologic disorders and skin lesions. • Analyze the pathophysiology of the most common dermatologic problems such as acne, eczema, psoriasis, skin infections and skin tumors. • Apply evidence-based knowledge to practice in order to improve outcomes for patients with psoriasis, acne & other common skin disorders. • Interpret cutaneous abnormalities associated with serious underlying medical problems and internal malignancy • Recognize common skin lesions and rashes that present in childhood • Identify common skin infections and apply evidence-based knowledge to improve therapeutic outcomes. • Recognize the clinical presentations of nonmelanoma skin cancers, melanoma, and pre-cancers. • Utilize a practical approach for managing your patients at risk for skin cancer and update your knowledge of the treatment approaches, including surgery. • Demonstrate use of dermoscopy as a tool assess skin lesions and determine when to biopsy pigmented lesions • Assess the appropriate use of cryotherapy and electrosurgery along with the pitfalls. • Differentiate between skin biopsy techniques and know when, why and how to perform them. • Correctly document E/M services and accurately code for dermatological procedures. • Appropriately utilize an understanding of the use of Botulinum Toxins, Fillers, lasers and IPL use in dermatology cosmetic procedures. • Recognize aging skin changes and implement cosmetic interventions. • Review basic dermatologic surgery techniques and suture materials. Topics in Anesthesia is organized by Northwest Anesthesia Seminars (NWAS) and will be held from Jun 13 - 16, 2019 at Margaritaville Key West Resort & Marina, Key West, Florida, United States of America. Target Audience: This course is designed for physicians, certified registered nurse anaesthetists, physician assistants, nurse practitioners, registered nurses and other medical care providers who must maintain state-of-the-art knowledge of the speciality or are impacted by it. Accreditation: This activity has been planned and implemented in accordance with the accreditation requirements and policies of the Accreditation Council for Continuing Medical Education (ACCME) through the joint providership of The A. Webb Roberts Center for Continuing Medical Education of Baylor Scott & White Health and Northwest Anesthesia Seminars. The A. Webb Roberts Center for Continuing Medical Education of Baylor Scott & White Health is accredited by the ACCME to provide continuing medical education for physicians. The A. Webb Roberts Center for Continuing Medical Education of Baylor Scott & White Health designates this live activity for a maximum of 20 AMA PRA Category 1 Credit(s)™. Physicians should claim only the credit commensurate with the extent of their participation in the activity. American Board of Anesthesiology: CME credit will be sent directly to The American Board of Anesthesiology to fulfil the Part 2 requirement for the Maintenance of Certification in Anesthesiology Program (MOCA®). Canadian Physicians: This activity is eligible for Section 1 credits in the Royal College’s Maintenance of Certification (MOC) Program. Participants must log into MAINPORT to claim this activity. Certified Registered Nurse Anesthetists: This program has been prior approved by the AANA for 20 Class A CEC; AANA Code #1036385; Expiration Date 6/16/2019. Nurse Practitioners: The American Academy of Nurse Practitioners Certification Program (AANPCP) and the American Nurses Credentialing Center (ANCC) accept CME from organizations accredited by the ACCME. Osteopathic Physicians: This program is eligible for Category 2 credit with the American Osteopathic Association (AOA). Physician Assistants: The American Academy of Physician Assistants (AAPA) accepts certificates of participation for educational activities certified for AMA PRA Category 1 Credit™ from organizations accredited by ACCME or a recognized state medical society. Physician assistants may receive a maximum of 20 hours of Category I credit for completing this program. Registered Nurses: NWAS is an approved provider for the following state nursing boards: Arkansas State Board of Nursing (Provider Number 50-7480), California Board of Registered Nursing (Provider Number 4833), District of Columbia Board of Nursing (Provider Number 50-7480), Florida Board of Nursing (Provider Number 50-7480), Georgia Board of Nursing (Provider Number 50-7480), and the South Carolina Board of Nursing (Provider Number 50-7480). This program offers 20 contact hours. †Pharmacology hours subject to change. Program Purpose: Presentations are designed to facilitate the physician, nurse specialist, and other providers maintaining skills of the same kind to review and update knowledge and abilities in one or more of these areas vital to the practising professional: • Possess the scientific background for clinical practice • Maintain state-of-the-art knowledge of not only the speciality but also of all additionally related disciplines which may impact it • Maintain an up-to-the-minute armamentarium of knowledge and skills for the selection and use of complex equipment, pharmacological agents, and procedures necessary for the provision of quality patient care • Manage self and colleagues to function toward common goals in the clinical setting, the clinical and educational institutions, and the community in which the practice resides • serve as an expert in matters involving health care delivery; serve as an informed manager of clinical and educational services provided, including the acquisition and distribution of resources necessary in meeting professional goals • Provide assistance with and support of other service providers, departments, institutions, and organizations dependent upon the professional expertise of the practitioner Objectives: At The Conclusion Of This Program, The Participant Will Be Able To: • At the conclusion of this activity, the participant will be able to: • Apply the pertinent physical and behavioural sciences - to include but not be limited to advanced anatomy and physiology, pathophysiology, chemistry, physics, psychology, and social sciences - as they impact and are affected by the planning, delivery, and monitoring of anaesthesia and related services inherent in the anaesthesia professions. • Explain the selection, dosing considerations with methods of administration, safe use, and contraindications and precautions of presented pharmacological agents through the understanding of their physicochemical properties, pharmacokinetics and pharmacodynamics, updated uses, and more recently developed additional, related, and similar drugs. • Outline comprehensive management plans for the group of patients discussed, whether related in age, physical status, cultural background, invasive procedure, anaesthetic or analgesic requirements, clinical setting, adverse reactions, and/or goals of care. • Apply the principles of safety and asepsis in the performance of anaesthetic procedures and administrations, equipment use, and other applications encountered during the provision of anaesthesia and analgesia whether in the surgical unit, the labour and delivery suite, the pain management clinic, or other more remote location of anaesthetizing services .• Incorporate the appropriate recommendations and/or requirements of pertinent external organizations, institutions, and professional groups - recognized as serving as the authority for and/or holding the responsibility to compile and approve such tenets - in the provision of anaesthesia and related services, whether medical, legal, philosophical, ethical or health care management standards. • Apply the new techniques in the clinical setting of the participant. Topics in Emergency Medicine is organized by Northwest Seminars and will be held from Nov 14 - 17, 2019 at Margaritaville Key West Resort & Marina, Key West, Florida, United States of America. The target audience for this medical event is physicians, physician assistants, nurse practitioners, registered nurses, and all other medical care providers who must maintain state-of-the-art knowledge of the specialty or are impacted by it. This CME Conference has been approved for a maximum of 20.00 AMA PRA Category 1 Credits. Course Description: The practitioner of emergency medicine must possess an evidence-based scientific background for competent clinical practice; maintain state-of-the-art knowledge of the specialty and all additional related disciplines; maintain an up-to-the-minute armamentarium of knowledge and skills for the selection and use of complex equipment, pharmacological agents, and procedures; manage self and colleagues to function toward common goals in providing consistent care in all settings in which emergency care is provided; serve as an expert in matters involving quality, safe and equitable health care delivery and support of other service providers, departments, institutions, and organizations dependent upon professional expertise. Presentations are designed to facilitate the acquisition of cognitive and technical skills as defined through evidenced-based data translated to best practice standards by the pertinent governmental and professional organizations including the American College of Emergency Physicians, American College of Surgeons and the Emergency Nurses Association and abilities in one or more of the disciplines vital to the practicing professional. Course Objectives: At the conclusion of this activity, the participant will be able to: • Apply the pertinent physical and behavioral sciences as they impact and are affected by the planning, delivery, and monitoring of services inherent in the professions • Explain the selection, dosing considerations with methods of administration, safe use, contraindications and precautions of drugs based on their chemical and pharmacologic properties • Outline comprehensive patient management plans for the special patient population discussed • Apply the principles of safety and asepsis in the performance of all aspects of patient care regardless of the clinical environment in which the practice resides • Incorporate the published tenets of pertinent, recognized external organizations, institutions, and professional groups defining medical, legal, philosophical, ethical, and healthcare management standards. Additional details will be posted as soon as they are available. Endocrinology for Primary Care is organized by Medical Education Resources (MER) and will be held from Nov 22 - 24, 2019 at Margaritaville Resort & Marina, Key West, Florida, United States of America. This CME Conference has been approved for a maximum of 12 Credit Hours. Additional details will be posted as soon as they are available. 2019 Innovations in Wound Healing (IWH) Conference is organized by Well-Assembled Meetings and will be held from Dec 05 - 08, 2019 at Casa Marina Key West, A Waldorf Astoria Resort, Key West, Florida, United States of America. This CME Conference has been approved for a maximum of 14.75 AMA PRA Category 1 Credits™. Target Audience: Our target audience comprises of clinicians, developers, students and scientists from government, academia, and industry who share an interest in innovative ideas and novel therapies for tissue regeneration and the treatment of chronic wounds. Conference Description: Our 6th Annual Innovations in Wound Healing (IWH) unique meeting is led by a group of experienced educators, scientists and clinicians interested in communicating new approaches to the repair of tissues throughout the human body. The program will focus on the science of tissue repair and the implementation of new findings. We share a vision of establishing a welcoming venue to disseminate and exchange the latest advances and thinking in the science of tissue repair and the development of novel, improved strategies to address an important medical need. Participants will gain a broader perspective of the challenges of moving basic science discovery into patient care, from our presentations that extend from molecular biology to clinical development, This one-of-kind conference will be a balance between formal presentations, informal discussions, and poster sessions, with the goal of maximizing networking opportunities for all involved. The goals of IWH are to provide an intimate environment in which to discuss innovative ideas in research and development that will impact wound care and tissue repair. To maximize personal interaction between faculty and attendees in both social and didactic settings. Additional details will be posted as soon as they are available. Critical Care: The Team Approach is organized by Northwest Seminars and will be held from Mar 23 - 26, 2020 at Margaritaville Key West Resort & Marina, Key West, Florida, United States of America. Target Audience : This course is designed for physicians, physician assistants, nurse practitioners, registered nurses, and all other medical care providers who must maintain state-of-the-art knowledge of the specialty or are impacted by it. Accreditation: The A. Webb Roberts Center for Continuing Medical Education of Baylor Scott & White Health designates this live activity for a maximum of 20 AMA PRA Category 1 Credit(s)™. Physicians should claim only the credit commensurate with the extent of their participation in the activity. Physician Assistants: The American Academy of Physician Assistants (AAPA) accepts certificates of participation for educational activities certified for AMA PRA Category 1 Credit™ from organizations accredited by ACCME or a recognized state medical society. Physician assistants may receive a maximum of 20 hours of Category I credit for completing this program. Registered Nurses: NWS is an approved provider for the following state nursing boards: Arkansas State Board of Nursing (Provider Number 50-7480), California Board of Registered Nursing (Provider Number 4833), District of Columbia Board of Nursing (Provider Number 50-7480), Florida Board of Nursing (Provider Number 50-7480), Georgia Board of Nursing (Provider Number 50-7480), and the South Carolina Board of Nursing (Provider Number 50-7480). This program offers 20 contact hours. Course Description : The practitioner of emergency medicine must possess evidence-based scientific background for competent clinical practice; maintain state-of-the-art knowledge of the specialty and all additional related disciplines; maintain an up-to-the-minute armamentarium of knowledge and skills for the selection and use of complex equipment, pharmacological agents, and procedures; manage self and colleagues to function toward common goals in providing consistent care in all settings in which emergency care is provided; serve as an expert in matters involving quality, safe and equitable health care delivery and support of other service providers, departments, institutions, and organizations dependent upon professional expertise. Presentations are designed to facilitate the acquisition of cognitive and technical skills as defined through evidenced based data translated to best practice standards by the pertinent governmental and professional organizations including the American College of Emergency Physicians, American College of Surgeons and the Emergency Nurses Association and abilities in one or more of the disciplines vital to the practicing professional. Course Objectives : At the conclusion of this activity, the participant will be able to: • Apply the pertinent physical and behavioral sciences as they impact and are affected by the planning, delivery, and monitoring of services inherent in the professions • Explain the selection, dosing considerations with methods of administration, safe use, contraindications and precautions of drugs based on their chemical and pharmacologic properties • Outline comprehensive patient management plans for the special patient population discussed • Apply the principles of safety and asepsis in the performance of all aspects of patient care regardless of the clinical environment in which the practice resides • Incorporate the published tenets of pertinent, recognized external organizations, institutions, and professional groups defining medical, legal, philosophical, ethical, and health care management standards. Additional details will be posted as soon as they are available. Southeastern Society of Oral and Maxillofacial Surgeons (SSOMS) 71sh Annual Meeting is organized by Southeastern Society of Oral and Maxillofacial Surgeons (SSOMS) and would be held during Apr 21 - 26, 2020 at Casa Marina, A Waldorf Astoria Resort, Key West, Florida, USA. The targeted audience for this medical meeting basically for Dentists. Topics in Emergency Medicine is organized by Northwest Seminars (NWS) and will be held from Nov 19 - 22, 2020 at Key West, Florida, United States of America. Additional details will be posted as soon as they are available.